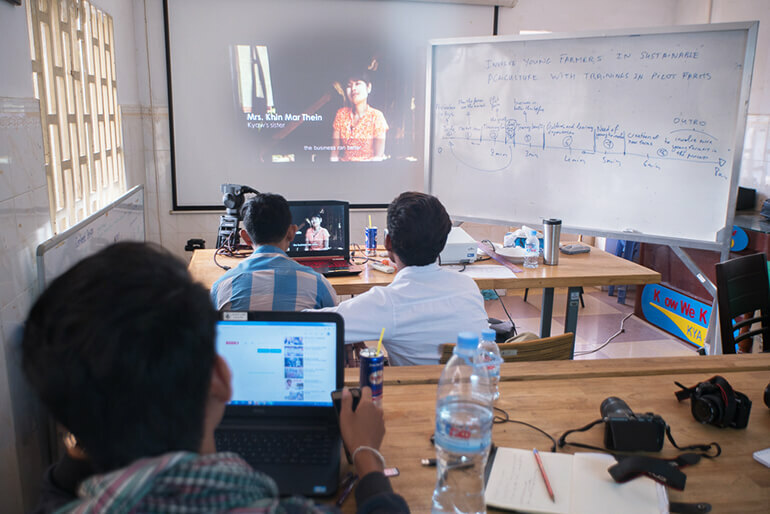 The audiovisual production team of the Cambodian NGO Khmer Youth Association (KYA) spent a week in October 2018 training in film-making techniques relating to the challenges of the rural world. KYA wants to develop video content for young people, to draw attention to the different rural areas of Cambodia and offer them new opportunities. There are many projects led by young entrepreneurs or farmers in Cambodia, often assisted by NGOs, but little information is circulated on these topics. These videos will make it possible to draw attention to innovative and alternative practices such as agroecology and highlight the absolute necessity of adapting to climate change. Germain Priour, a documentary filmmaker and trainer for the MediaSeeds association, provided support to an eight-person team during this week. In partnership with GRET, he has already trained small farmers to document their agroecology practice and produced a number of videos on farmers in the Mekong region. This session addressed the entire process of making a video: researching the subject, the angle of approach, preparation for shooting, filming using a camera and/or smartphone and postproduction. The team filmed the series pilot, about a farmer producing organic vegetables, over two days in the province of Kamong Spoe. Several videos will shortly be produced in the different provinces. They will be broadcast regularly on social media, and in the national and local media. KYA also has "tuk-tuks" (motorised tricycles which are very popular in Cambodia) equipped with a television, to hold screenings in villages in more remote areas.